"While we are working on your project...we encourage you to visit our shops and view your ironwork as it progresses." 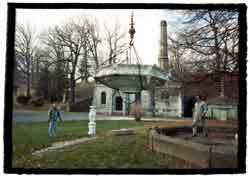 Before-and-after-restoration pictures above show the 23 foot tall, 14-ton cast iron Mt. 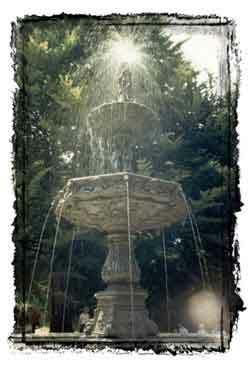 Hope Cemetery florentine fountain in Rochester, N.Y., restored by Architectural Iron Company. 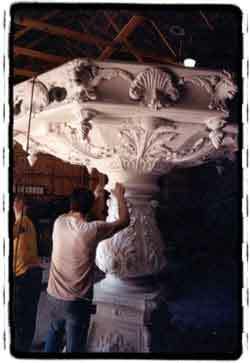 The fountain, inoperable for more than 60 years, missing more than 200 decorative pieces, covered with 22 layers of paint - was disassembled and removed to Milford, PA for restoration. Working from a 1880's photograph, detail section blowups were made to reveal the intricate details necessary to create new patterns for the new casting. 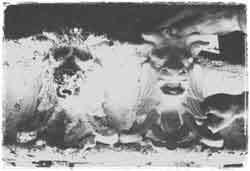 Recreated garden gargoyals, wolve's heads, acanthus leaves and acorns; flowers, scrolls, and shells...are indistinguishable from the restored orginal ornaments. 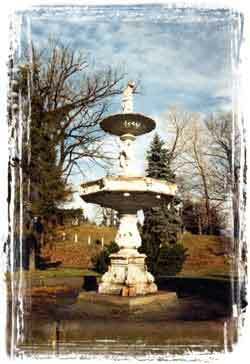 ARCHITECTURAL IRON COMPANY will remove all of the existing ironwork to our shops in Milford, Pennsylvania. A temporary fence or substitute structure is usually provided where the ironwork removed had provided a functional purpose. Once in our shops, all cast and wrought iron pieces are sandblasted or shotblasted to remove accumulations of the multiple layers or paint which have usually obscured much of the original detail. This access to the underlying metal also allows us to correct defects frequently found in the original iron work. 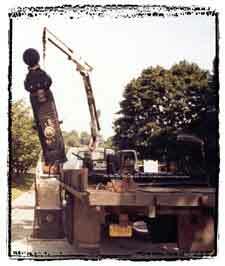 Special abrasives are used to prevent any damage to the underlying metals. 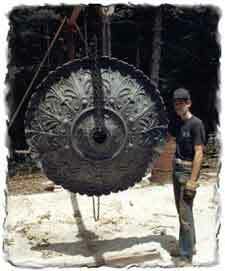 And, in delicate brass and copper work, other methods are used. Once the underlying metal is bared, we can evaluate which castings can be reused, and which must be replaced. 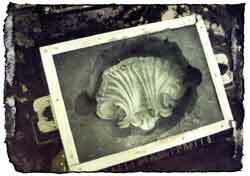 Original ironwork is salvaged wherever possible. For the castings which must be replaced, our patternmaker sets to work constructing wooden patterns. Our technicians and skilled welders will rehabilitate the original attachment points on the castings which will be reusable. After priming and painting wrought and cast iron pieces are assembled into "field units"...manageably sized sections that will form a portion or, for example, a fence. While the size of the field units varies. they are generally limted to the weights of a ton, and lengths of approximately ten feet. Field units are then installed Filed units are then intstalled at their original site, most often using poured lead for attachment into stone...for true replication of the original process. When the stone foundation on a site requires re-alignment (frequently the case in northern parts of the country where a hundred or more years of annual freezing and thawing will heave and move out-of-place a stone weighing as much as a ton), we will re-position the anchoring stone prior to installation of your restored ironwork. Now completed. only periodic protective surface refinishing is required to preserve the beauty...and to safeguard the structural integrity of your restored American architectural ironwork.